Bosch and Daimler have created a fully functional automatic parking system at the Mercedes museum in Stuttgart with full roll-out expected next year. Daimler and Bosch have teamed up to realise driverless parking (Automated Valet Parking) in the multi-storey car park at the Mercedes-Benz Museum in Stuttgart. Cars now proceed without a driver to their assigned parking space in response to a command issued by smartphone, without any need for the driver to supervise the manoeuvre. Automated valet parking marks an important milestone on the way to autonomous driving. The pilot at the multi-storey car park of the Mercedes-Benz Museum represents the world’s first infrastructure-supported system for an automated drive-up and parking service in real-life dual operating mode. From the beginning of 2018, visitors to the museum’s multi-storey car park will be able to experience the convenient service at first hand and avoid spending time parking their cars. Parking will be an automated process in the future. By applying an intelligent multi-storey car park infrastructure and networking it with vehicles, we have managed to realise driverless parking substantially earlier than planned,” said Gerhard Steiger, Director of the Chassis Systems Control unit at Bosch. Anyone can reserve a car using a smartphone app. The vehicle rolls into the pick-up area autonomously to start the journey. The return procedure is equally convenient: the customer parks the vehicle in the car park’s drop-off area and hands it back by smartphone app. After being registered by the intelligent system installed at the multi-storey car park, the car is started and guided to an assigned parking space. Driverless parking is made possible by an intelligent multi-storey car park infrastructure from Bosch in conjunction with the vehicle technology from Mercedes-Benz. Sensors installed in the car park monitor the driving corridor and its surroundings and steer the vehicle. The technology on board the car performs safe driving manoeuvres in response to the commands from the car park infrastructure and stops the vehicle in good time when necessary. The sensors for the multi-storey car park infrastructure and the communications technology come from Bosch. Daimler is providing the private museum car park and pilot vehicles, defining the interface between infrastructure and vehicle together with Bosch and adapting the sensor technology and software in the vehicles accordingly. The premiere on 24 July 2017 is to be followed by an extensive trial and commissioning phase. The project has been overseen from the outset by local authorities – Stuttgart regional council and the federal state transport ministry – and by appraisers from the TÜV Rheinland technical inspection authority with the aim of assessing the safe operation of the vehicle and car park technology. Before the driverless customer service goes into operation at the beginning of 2018 – as the first such application worldwide – final approval will be required from the licensing authority. Everything will then be in place to enable automated valet parking to be made available to everyone at the Mercedes-Benz Museum’s multi-storey car park from the beginning of 2018. 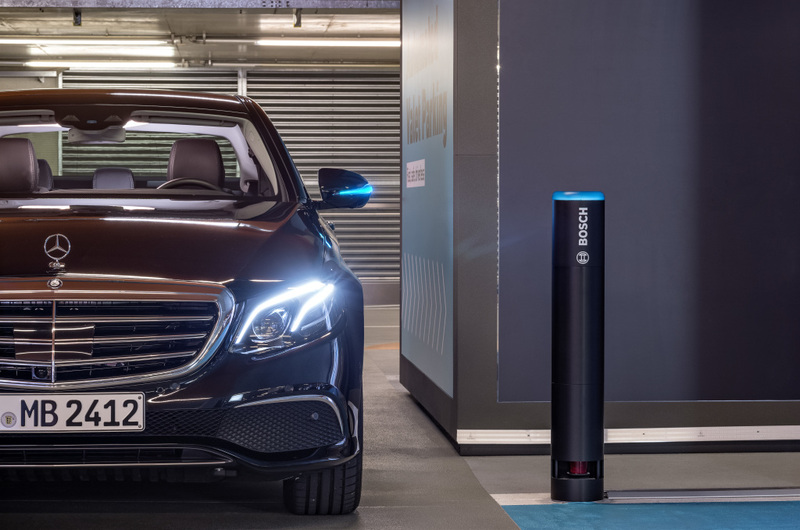 Bosch and Mercedes-Benz intend to use this project to acquire experience regarding users’ handling of automated valet parking. Other existing multi-storey car parks can be retrofitted with the infrastructure technology. For the operators of multi-storey car parks, driverless parking means more efficient use of the available parking space: up to 20 percent more vehicles fit into the same space.